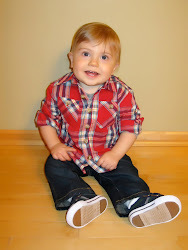 This is a post I should have made a long time ago, but I wanted to share how we transformed Noah's room into Oliver's room since I talked so much about how difficult it was to make that transition and to decide to "change" the room. I still think of it as Noah's room as well as Oliver's room. I feel like Noah is still in that room watching over his little brother. But I do call it "Oliver's Room" more and more. For awhile, while we were transitioning it, I couldn't call it that. I just called it "The Nursery" or "The Baby's Room". It felt weird to stop calling it "Noah's Room." But as you'll see, there are still very much parts of Noah in this new room. Here is Noah's room as it was left after he died. It was a Pottery Barn Monkey theme. 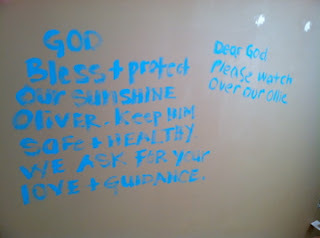 Here are the messages we wrote on the walls before they got painted. We changed where the crib is placed. So on the wall where Noah's crib was we wrote messages to him. 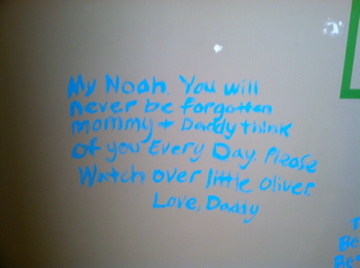 On the wall where Oliver's crib would go we wrote messages to him. And here is Oliver's room. It's completely different!! There is a rainbow mobile to represent Noah watching over his brother while he sleeps. This is the part of the wall we left unpainted from Noah's room. 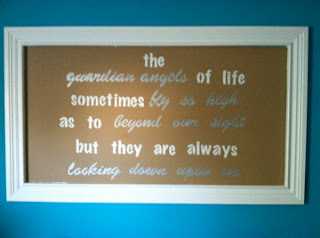 It's framed out and has a guardian angel quote. So as you can see the room is completely transformed, yet there are still very much pieces of Noah in this room. It is definitely a bright and cheerful room. I'm so happy with how it turned out and I'm happy that Oliver gets his own room that is special to him, yet his brother is still very much a part of it. There is no way I could have done this room by myself. My friend Sarah Martin (from Majesty Companies) is an interior designer and helped me create the look and feel I wanted for this room. She painted the whole thing herself as well. She's amazing!!! You guys are incredible!! I LOVE the before and after for Oliver. 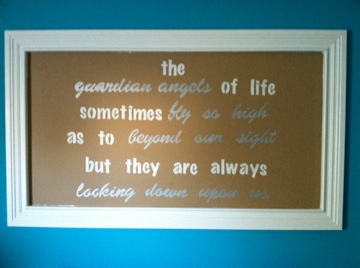 But I also LOVE, LOVE the writings before you painted and the guardian angel picture you hung in his memory. You guys did a wonderful job making room for Oliver and his big brother!! You guys should be very proud! Thanks for sharing Jenna. You both have done a great job and again, the love you both share for Noah and Oliver is inspiring and is felt in these posts. Thanks for reminding me daily what strength and love is all about! Wow, thank you for sharing. That was such a wonderful idea to write notes to each boy before painting.